The brief respite of the division in England ended on July 2nd with division units assembling in the Plymouth and Falmouth areas, loading onto LCI’s, LCT’s and LST’s for the cross channel trip to France. On July 5th through choppy waters, we arrived at Omaha Beach where twenty-nine days before the 1st and 29th Division had barely survived their blood bath. As the landing craft approached the sandy beaches, ramps dropped, doors opened and the Santa Fe men waded ashore, fascinated by the still menacing bluffs, cliffs, pillboxes, gun emplacements, broken equipment and debris that covered the landscape and dominated the landing areas. Everywhere men were bustling, moving equipment and supplies, loading trucks – but all carefully avoiding the white tape lined minefields that had not yet been cleared. 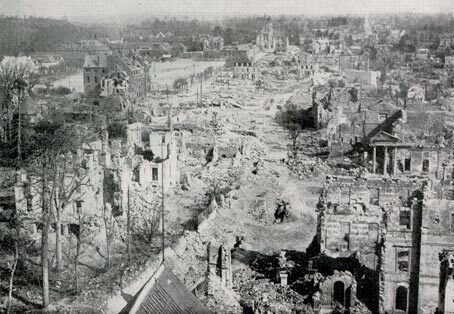 Gunfire could be heard in the distance where the British and Canadians were still fighting around Caen. Up ahead was a long upward sloping dozed road along which infantry single filed past abandoned machine gun emplacements, shattered concrete fortifications, trenches and barbed wire. On everyone’s mind was the scary question, “How did anybody ever make it?” Looking far to the East beyond the end of the sandy beach, perhaps two miles or more distant, could be seen long rows of wooden crosses extending over the crest of a distant hill. We could only guess that these must mark the graves of those who hadn’t made it through. This is now the site of the very beautiful American Cemetery at Colleville-Sur-Mer, but then it was a sobering sight for newly arriving green troops who were soon to see an even more sobering sight, the hedgerows of Normandy. These were ancient checkerboards of small fields – one, two, three acre tracts lined by trench-like dirt paths and narrow cart sized roads, bordered by mounds of dirt, stones, trees, and almost impenetrable hedges, some five to as high as thirty feet high, all providing a lattice work of miles of ready built trenches which would limit sight and movement, and make it possible for determined defenders to fight a World War I trench type of warfare with the potential for enormously high rates of casualties. Reports of these had already begun. Everywhere were likely machine gun positions, ideal hidden sniper spots, and invisible mortar sites. We moved ever closer to the front lines and into an assembly area. The division was now attached to the First Army under Gen. Omar Bradley, and assigned to Maj. Gen. Charles H. Corlett’s XIX Army Corps which was about to launch an attack to reach St. Lo, some seven miles away. St. Lo, with 12,000 inhabitants was the third largest city in this part of France, a transportation center and the likely base for any major German counter offensive. If captured, St. Lo could be the launching area for the Americans to break through the encircling German lines and launch the expected attack through France, perhaps even giving the Germans a taste of their own blitzkrieg tactics. The attack on St. Lo could not be avoided, but it soon turned into a nightmarish slugfest. The XIX Corps consisted of the battle weary 29th Division on the left and the battle tested 30th Division on the right. To the West were the American VIIth and VIIIth Corps with the following Divisions: the 83rd, 4th, 90th, 82nd, Airborne, and 79th Divisions and also the 3rd Armored Division. East of the 29th Division was the 2nd Infantry Division, and further to the East the British Army still held up at Caen. To strengthen the attack on St. Lo to the South, Gen. Corlett ordered the 35th Division to move into the front line between the 29th Division and the 30th Division. On the night of July 9th, the 320th Infantry took the left and the 137th Infantry the right as they each replaced a regiment of the other division. On the next day the commanders could look out over the lines where they would attack the next morning at 6:00 a.m. During the night, H Company of the 137th took the first fatality in the division, Pvt. Owen McBride, by a direct hit by an 88 on his foxhole. At 5 a.m. on July 11th, 1944 the artillery barrage commenced with 200 guns. At 6 a.m. the infantry moved out to the attack. The Corps’ attack immediately ran into deep trouble. The hedgerows were even worse than a fortified position as visibility was so severely limited even to the artillery observers in their light little planes. From D-Day to July 10th, the entire American Army in Normandy had suffered 30,000 casualties. In the eight days thereafter, the XIX Corps with its supporting 3rd Armored Division and the adjacent 2nd Division took almost 11,000 casualties. The 30th Division suffered 3,934, the 19th - 3,708, the 35th Division - 2,437. This operation was named the Battle of the Hedgerows. The entire line had jumped off on time but nobody got very far, as we all ran into a German main line of resistance with 75mm, 88mm, and 150mm cannon fire, light and heavy machine guns and machine pistols, and both light and 80mm mortars. We ran into land mines, booby traps and Mauser equipped snipers and riflemen. The enemy were all veteran troops and included the 2nd and 3rd Parachute Divisions, the 629th Infantry Regiment, the 352nd Infantry Division which had caused so much havoc on Omaha Beach, and three Panzer Grenadier Regiments, the 897, 898 and 899th, and the Panzer Lehr Armored Division, probably the best Panzer division in Europe. Regardless of how we might well disparage the cause of the German troops, we cannot question ever their tenacity, their skill, their equipment, their zeal and discipline, and their supreme confidence in Adolph Hitler. The troops in front of us were part of what was considered the finest infantry in Europe, perhaps in the world. And it required our utmost teamwork of the many American arms, including the Air Force, to overpower and wear down the German divisions in front of us throughout the war. Every G.I. learned to respect the Wehrmacht and the fighting qualities of the German soldier.